Our highly experienced team have a wealth of experience in all aspects of equine medicine and surgery and are more than happy to cater for all your equine needs. Six of our clinicians have gained further certification in their field of interest or are currently in the midst of their studies. Alasdair Topp MRCVS and Alastair Sanderson MRCVS are both now registered on the Royal College of Veterinary Surgeons List of Advanced Practitioners. You can find out about all of our team members in the 'meet the team' tab. We are all highly motivated and consistently work to keep abreast of new advances in our fields of interest, continually striving to provide the highest standard of care to our patients. Not only do we pride ourselves on our wide experience and expertise, we also seek to provide a kind and friendly service; many of our patients and their owners become our friends. 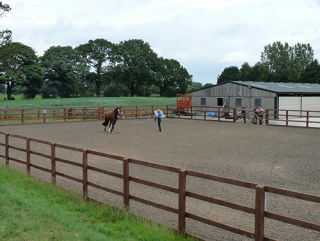 Our team are also actively involved in horse sports locally, nationally and internationally. Campbell Thompson worked for five years as the British Equestrian Team Vet including the 2000 Sydney Olympics in addition to being the FEI Vet to the British Masters and assisting at Brand Hall horse trials. Alistair, Alasdair, Laura and Campbell are all still heavily involved in the local racing community acting as official veterinary surgeons at Sandon, Haydock Park and Aintree. Please feel free to come and introduce yourselves or say hello if you see us out and about!